Alabama Metal Roofing Material : We Ship Anywhere in AL. Located in the deep-south, Alabama can experience extreme heat and humidity. Consequently, when selecting roofing materials, you’ll want to be confident of its ability to keep out the heat and thus save on your cooling costs. Additionally, you’ll need to be prepared for severe weather including thunderstorms, tornadoes or hurricanes. A 25-50 year manufacturer’s warranty on most products. Several styles and colors to choose from. Many styles qualify for the EnergyStar tax credit. An application and style available to meet every project budget. Materials delivered directly to your job site. Looking for metal roofing in Alabama? 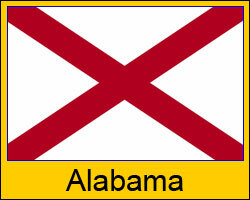 We service all cities and communities in Alabama including Mobile, Montgomery, Tuscaloosa, Birmingham and Huntsville. Our customer service team will assist you with your project from start to finish. Visit our design and price center and get prices now! Prices are valid for any area within Alabama and some shipping restrictions do apply. Click here for details on shipping to your jobsite.